The instructions in the email were intriguingly vague. "Take the subway at 18:06 from Oslo Central Station all the way to Voksenkollen" – some twenty stops and 500 vertical metres away, and roughly where the compact urban-ness of Oslo gives way to the vast expanse of wooded hills that is Oslomarka. Oslomarka is the Norwegian capital’s playground. It’s here where impressively fit Osloites come to walk, cycle and ski and generally rekindle their bond with nature, a bond that seems to be so deeply ingrained in the Norwegian DNA. But tonight the 30 people huddled in the train carriage are in for a different sort of experience. We’re here for a very special culinary adventure indeed. For this, our sixth event, Food Studio played host over two nights to the remarkable Danish craft brewery Bøgedal. Located on the edge of the Vejle river valley, some 200km to the west of Copenhagen, the old farm of Bøgedal was resurrected as a brewery in 2004 by the husband and wife team of Gitte Holmboe and Casper Vorting. 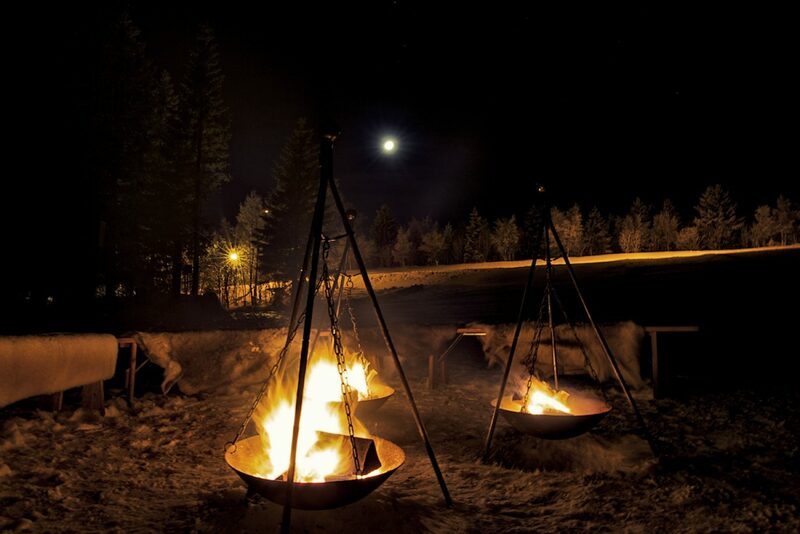 Together with her husband, Gitte transformed her ancestral courtyard farm into a unique brewery that completely eschews modern techniques – no machines, no computers, no pumps, just crackling wood fires and the centuries old sound of beer being brewed by hand. The result is Bøgedal’s version of «godtøl» («good beer» literally) – a full-bodied malty brew made according to the traditional brewing methods that prevailed across farms in Denmark until the last century. 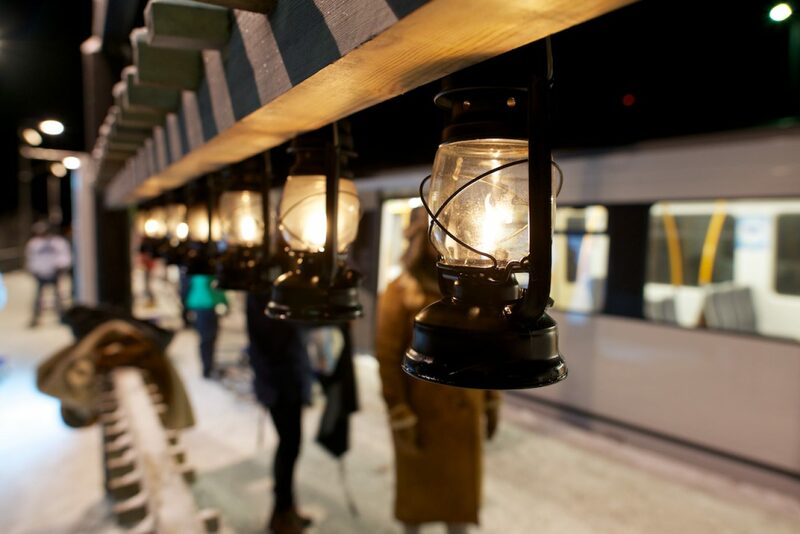 As the train pulled in to Voksenkollen station the mystery appeared to deepen. The guests picked up one of the burning oil lamps awaiting their arrival, and began the next part of their journey on foot. We had been warned to bring clothing suitable for walking in the snow, and sure enough we soon began an exciting journey through the ice-filled forest, the anticipation building with each step. Cold, brittle air filled our lungs as we walked past pine trees shimmering with frosty snow, and beautifully evocative ice lanterns had been planted along the way to mark our path. The thick layer of snow eerily soaked up all sounds, softening the buzz of conversation and the crisp crunch of our footsteps. A short traverse across a frozen lake revealed a virtually cloudless and moon-filled sky overhead, before we plunged back into the dense forest for the last leg of our journey. 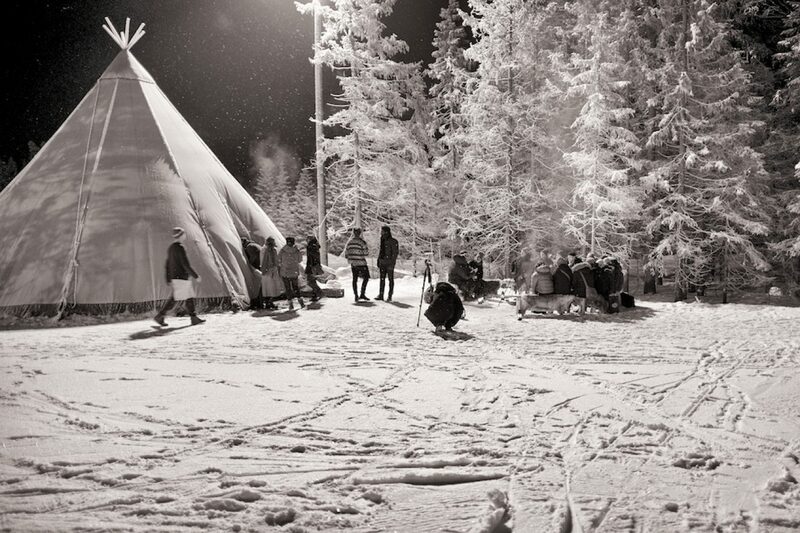 Eventually, a large traditional Sami lavvu tent some twenty metres wide loomed in the distance, with burning logs of birch glowing outside to welcome our arrival. This would be our base for the night. The walk couldn’t have been more than twenty minutes, but the transformation was complete. From the gritty urban sprawl of Oslo’s central station to the Narnia-esque landscape of the Norwegian forest in less than an hour. 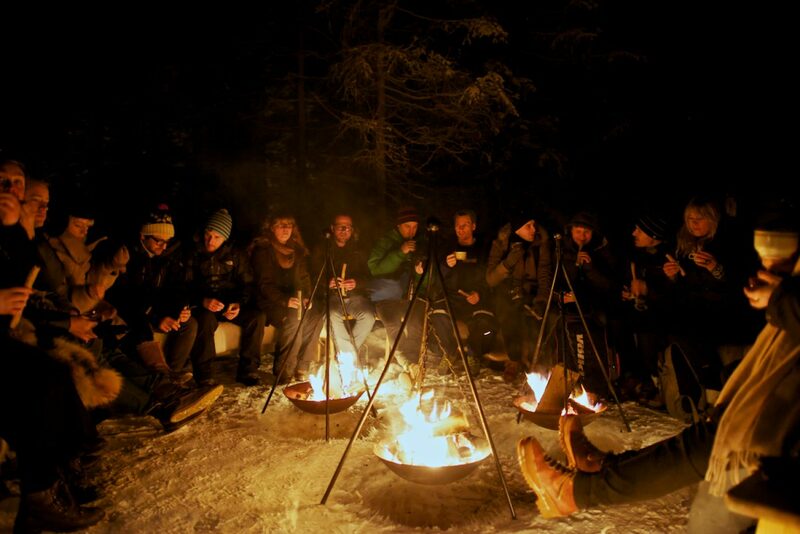 We took our seats outside on fur-lined benches, huddling around the fire to ward off the bracing temperatures of -15°C. A brief welcome from Food Studio founder Cecilie Dawes, a few words from Gitte and Thomas and then reviving mugs of hot beer grog were handed out. The piping hot grog was made with Bøgedal’s porter, lemon juice, brown sugar, and rum, making it as potent as it was warming. This was a perfect drink to sip by the fire; the porter adding mellow tastes of liquorice, caramel, chocolate and tobacco. To dip into the grog were sticks of twist bread made from rye, wheat and barley and infused with copious amounts of smoked bacon. But we wouldn’t just be drinking Bøgedal’s wonderful and rare beers (just 2,500 bottles are produced each month) as Gitte, who had made the journey over from Denmark to personally present each of the beers, was joined by chef Thomas Randsøe who has worked in top kitchens across the world. His experience allowed him to create a five-course seafood menu that would best showcase Bøgedal’s rich beers. And for this event Thomas would be assisted by Food Studio’s own chef, Magne Ilsaas. The guests were then led inside to the toasty warm lavvu that had been put up under the watchful eye of Food Studio’s scenographer Caroline Magnus, where thick traditional woollen lusekofte jumpers were handed out and the warm orange glow from the hanging oil lamps revealed tables that had been laid out with a simple Scandinavian elegance. 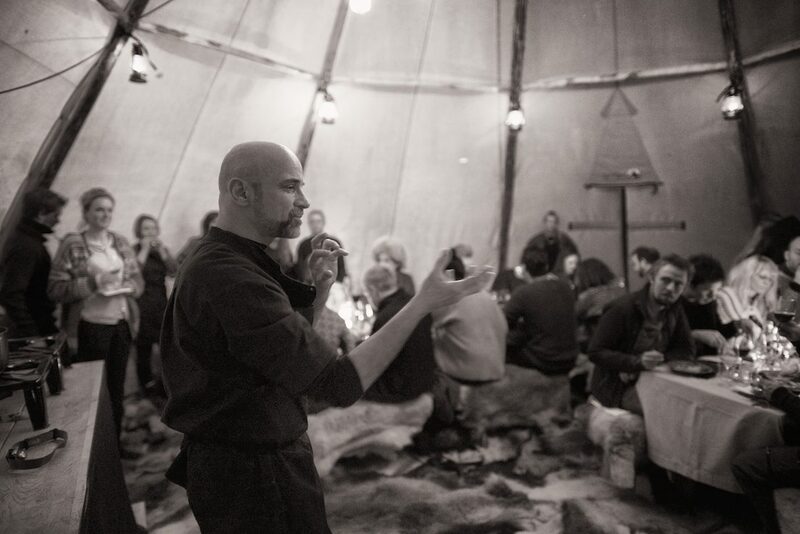 In traditional Sami style the entire floor was covered with reindeer pelts, while a makeshift kitchen was set up at the far end of the tent, where Thomas and Magne were busy working away. Once seated, the evening’s culinary adventure would begin in earnest. Course 1: Oysters with Light and Dark Beer. 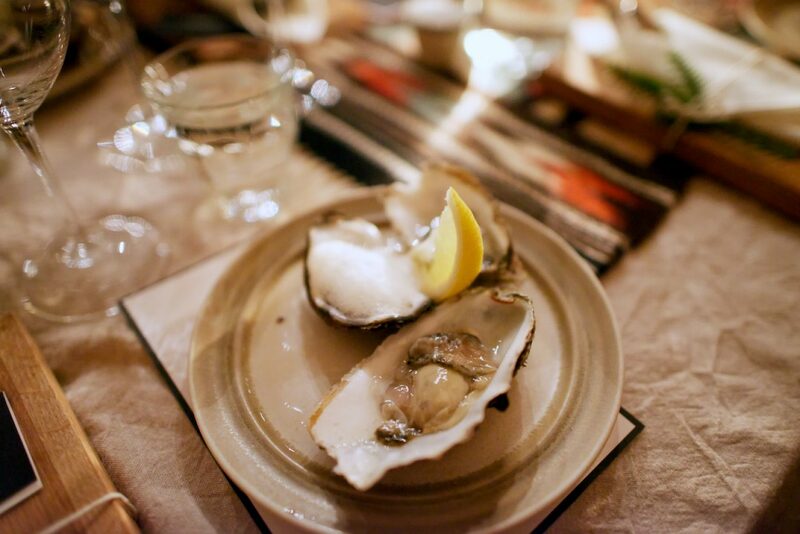 Sparklingly fresh oysters were simply served with beer foam and a wedge of lemon. To go with the oysters were two beers from Bøgedal. Bøgedal’s No.320 is a light and soft wheat beer with aromas of honey, flowers and apricots. In contrast, Bøgedal No.301 is a dark ale with notes of orange, coffee and caramel. The idea was to compare and contrast the flavour of the oysters with each of the beers prompting much discussion between guests. Course 2: Fried Halibut with Apples, Kale and Wheat Beer Beurre Blanc. This next course managed to silence the little corner of the table I was sitting on. 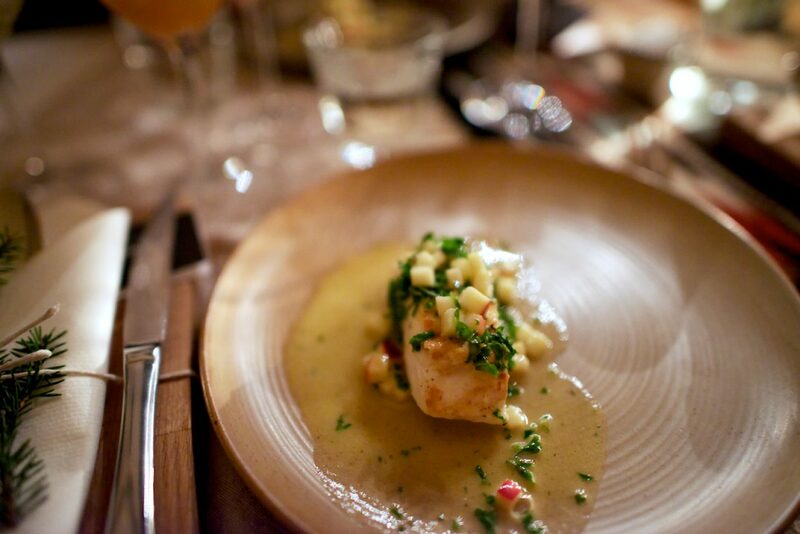 Pristine Norwegian halibut was pan-fried in butter and served with cubes of crisp acidic apple, bitter kale and a sublime beurre blanc made using wheat beer instead of white wine. This was a light, fresh tasting dish with spicy notes of orange and coriander seed coming through from the beer sauce. Paired with this course was Bøgedal’s wheat beer, a beer with higher than usual residual sugar and full of fruity richness. Course 3: Mussels with Almond milk, Beer and Air Dried Pork. 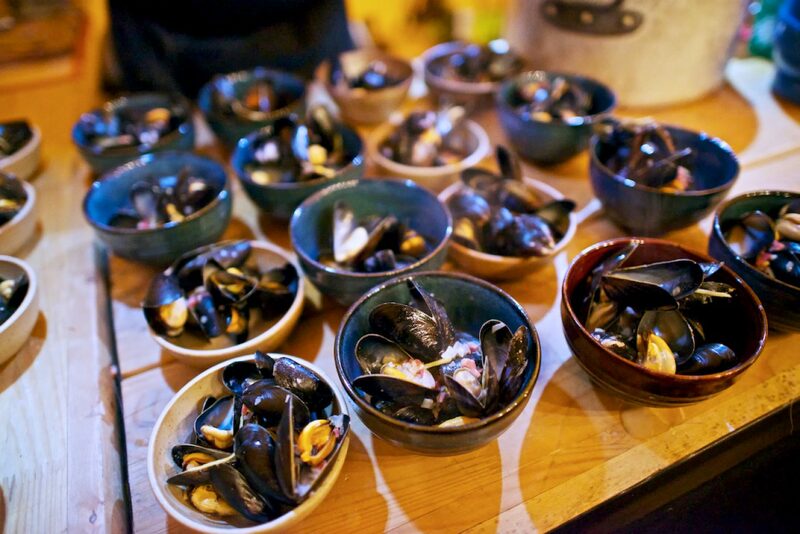 Mussels from Frøya were steamed in almond milk and pale ale and served with cubes of salty air-dried pork. This dish was also paired with Bøgedal’s No.320, whose soft sweetness balanced the saltiness of the pork nicely. Course 4: Monkfish and Langoustines Poached in Golden Ale with Sea Buckthorn. 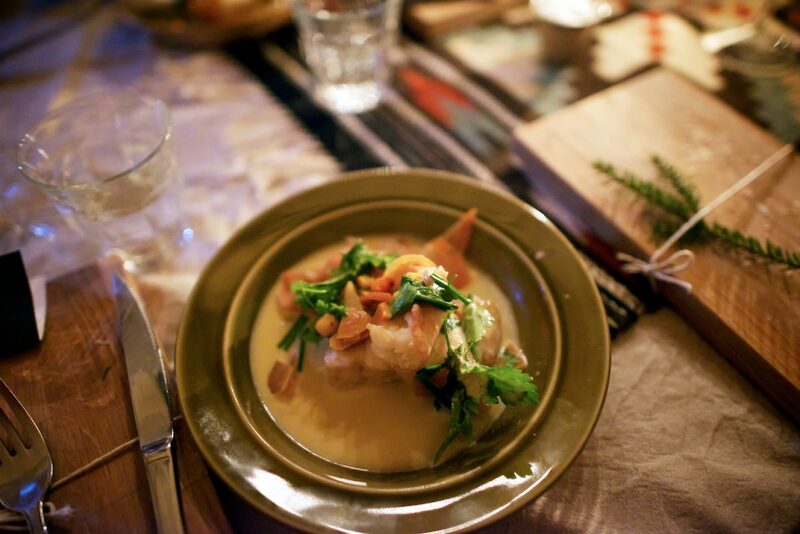 Monkfish fillets and langoustines tails (again from Frøya) were poached in a stock made from golden ale, carrots, onions, coriander seeds, and orange zest. They were garnished with leeks, parsley, chervil and tart sea buckthorn berries. For this course we drank Bøgedal’s delicious No.311, a dark, golden ale, with a smooth sweet caramel sweetness that nicely offset the sourness of the sea buckthorn. Course 5: Chocolate Tart with Beer Poached Pears. 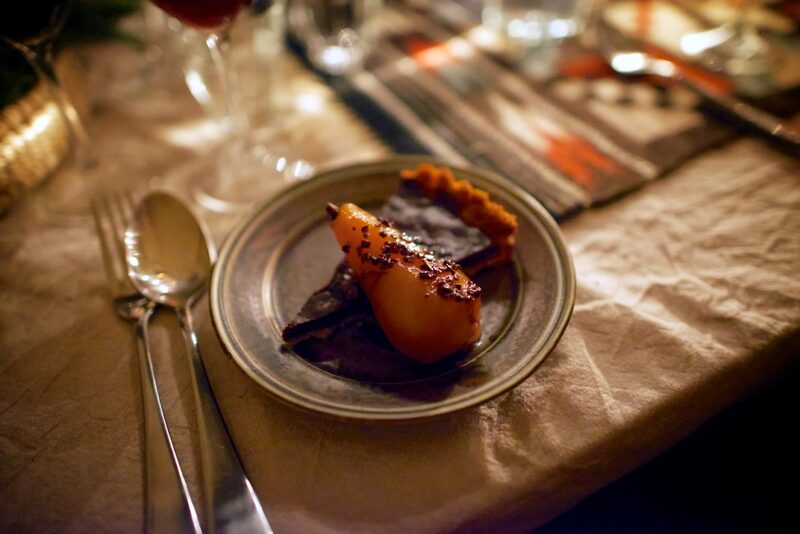 For the final course, a crowd-pleasing chocolate tart served with beer-poached pears and cocoa nibs made from criollo beans. This dish had a great contrast in texture – tender spiced pears, crunchy cocoa nibs and smooth silky dark chocolate ganache. Paired with this course was Bøgedal’s No.308, a delightful ‘dessert beer’ for want of a better word, full of flavours of vanilla and cocoa beans with a hint of anise. Coffee & Cocktails: We ended the meal with coffee. Fairly standard you might think? 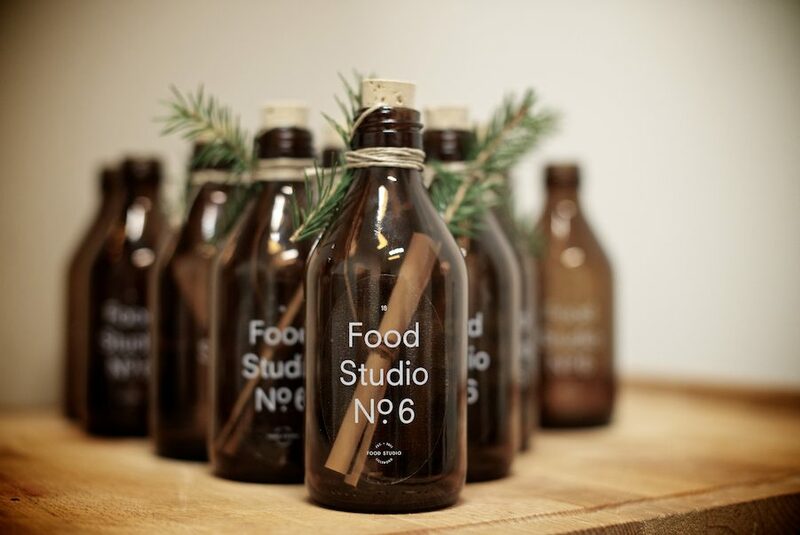 Well, as you might have guessed, Food Studio doesn’t really do ‘standard.’ For this, Food Studio again teamed up with the folks at Tim Wendelboe, one of Norway’s leading speciality coffee roasters, to bring its guests a coffee experience as memorable as the food and drink. For Norwegians, the association of drinking coffee while being out in nature is very strong indeed. 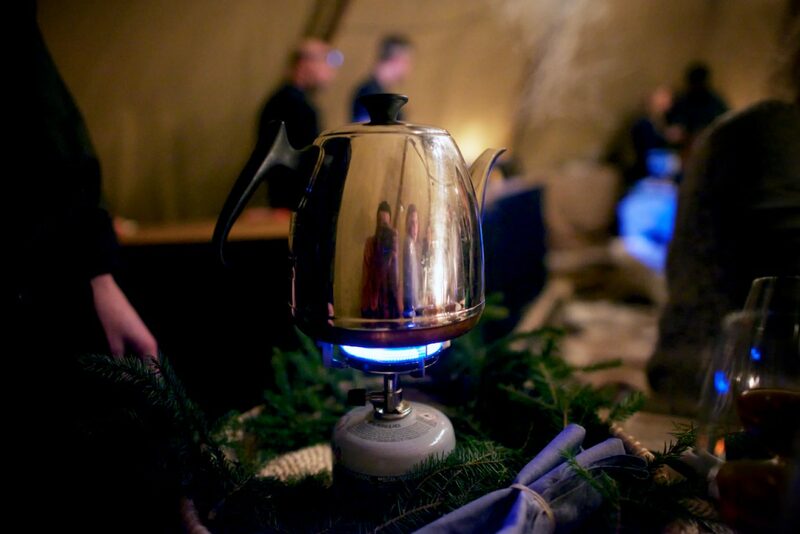 Most Norwegians will bring a flask of hot black coffee with them while they are out and about «på tur». 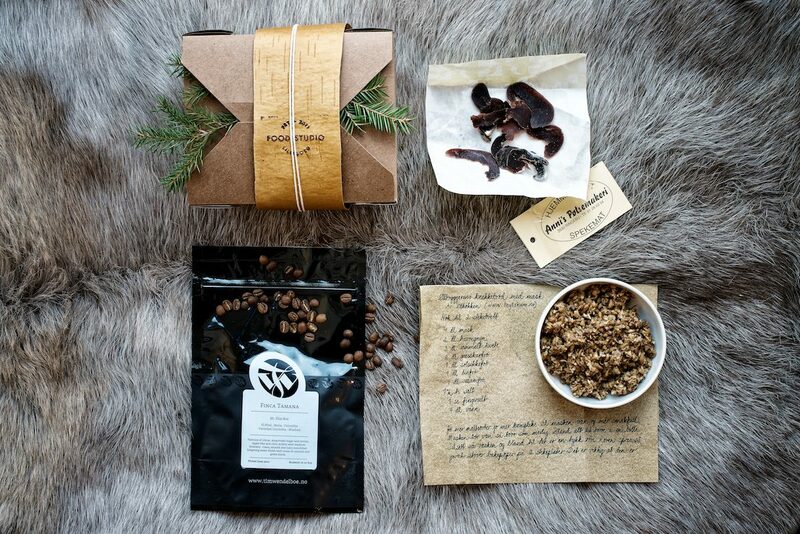 For longer excursions, you may even brew kokekaffe (literally «boiled coffee»). To recreate this experience a bit of audience participation was required, as we’d be brewing our own kokekaffe. Tim Varney, manager and roaster at Tim Wendelboe was on hand to explain the process. We’d be using coffee from the Finca Tamana estate in Colombia, an estate that Wendelboe has been working extensively with to perfect their growing and harvest processes. Each table was to grind exactly 65g of coffee beans by hand and add it to 1 litre of water that had been brought to a boil on a camping stove. The coffee was added to the water and allowed to steep for 4 minutes before being served. This gentle method ensures maximum flavour is extracted from the beans and the resulting cup of coffee was full of aromas of citrus, muscovado sugar and berries. So simple, yet so effective and a wonderful moment of communal bonding among the guests. Finally, we were served ‘one for the road’ by Anne Maurseth, bar manager at Oslo’s No.19 cocktail bar. 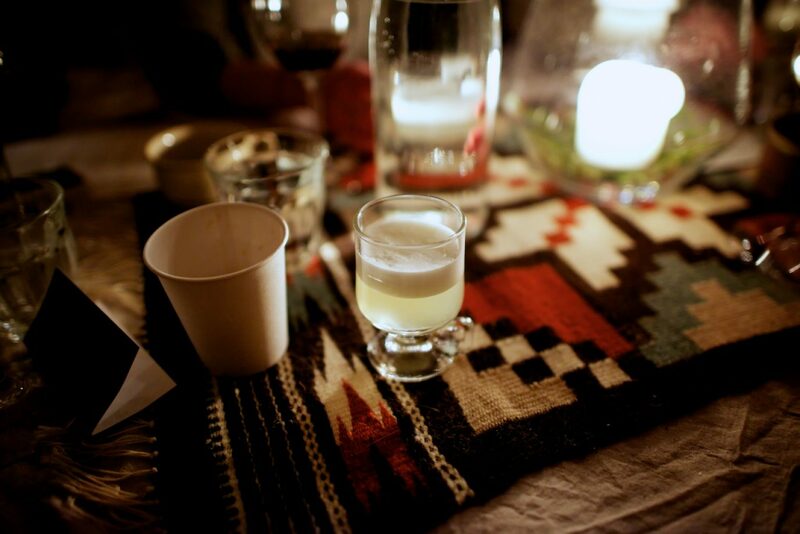 An unusual mix of crystal clear aquavit, gin, Lillet and lemon juice had been shaken with egg whites to make a refreshing Scandinavian-style sour. And with that, the evening gradually drew to a close. 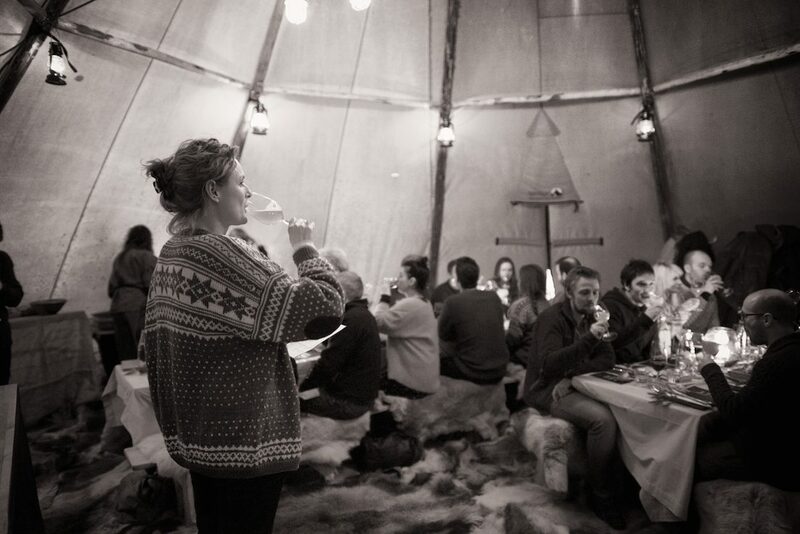 As guests left to catch the last train home and the energetic hum of conversation slowly died down, we could look back at what was a truly memorable evening of fantastic food and drink, a bond with nature rekindled, and much, much laughter. 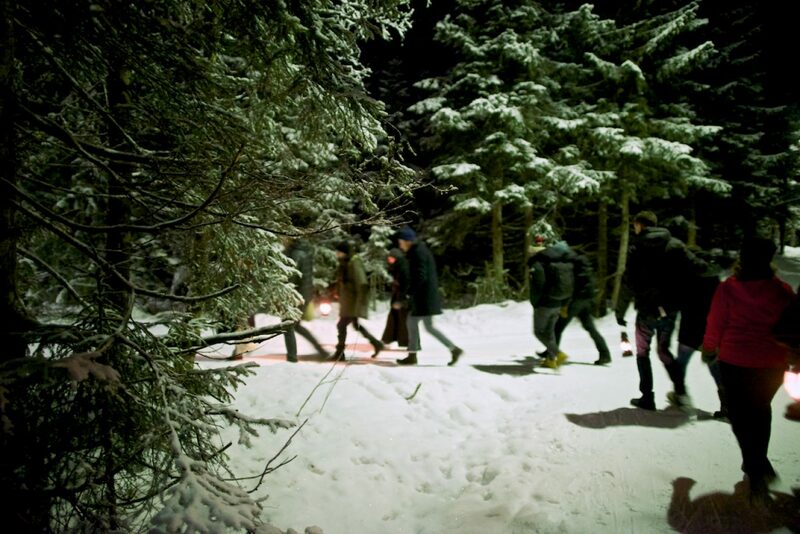 We hope you’ll be able to join us for our next event (sign up below to our newsletter for more details), which we promise will be every bit as unique as this magical night in the Norwegian forest. Recipes for all the dishes can be found here. 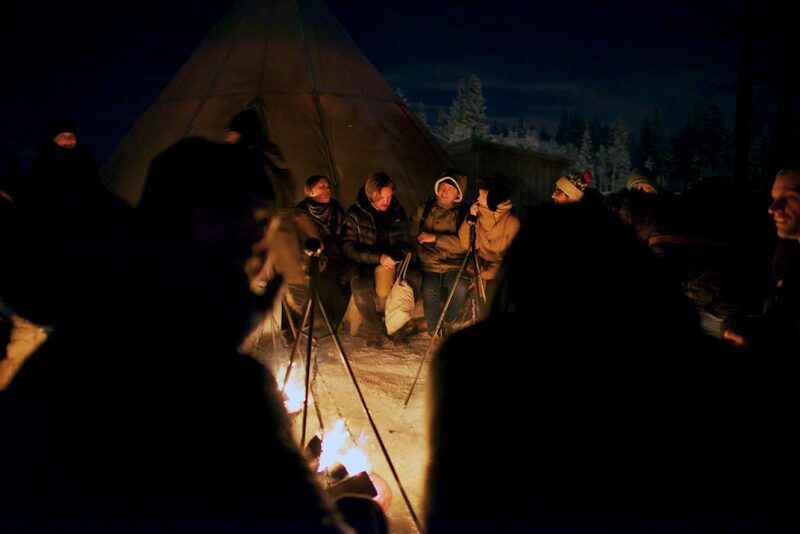 A huge thanks to all of the fantastic people who made this event happen: Ian Stendera at Oslo Winterpark who let us play at their lovely location together with Jonny Bakaas and Rune from Tentipi Hamar, who delivered the perfect space and made sure our guests stayed warm. Veslemøy Hvidsten at Moestue Grape Selections, the importer of Bøgedal beer, who helped us source the beer for the night, which isn’t usually available in Norway. Stein Arve Bernes and Ingrid Lillebø from Godt Brød Tryvann who let us use their facilities and delivered the bread for the nights. Eva-Lena Degerhäll from Granit who let us use their interior decorations to create the perfect backdrop to the Norwegian forest. Niklas Jiberg at Tingstad for giftbox packaging. Finn Paulsen at Fretex who supplied the cosy warm lusekofte jumpers and sheepskin jackets. And of course, all of the wonderful Food Studio team together with the team from Tim Wendelboe, whose tireless efforts made this event happen.